← Best tiles in Istanbul. Rustem Pasha Mosque. The Suleymaniye is a work that brings together all the elements to be exceptional. It is the largest mosque in Istanbul, was raised by the most important of the Ottoman sultans, the best architect built the Empire and is situated on one of the seven hills of Istanbul so it appears in the best-known sights of the city. As if all this was not challenging enough, from the time of laying the first stone was known that the building would be compared to Hagia Sophia. Despite all, the result fell short of what was expected and the building is a magnificent and innovative monument, undoubtedly one of the highlights of Ottoman architecture and brought new concepts of its own time. 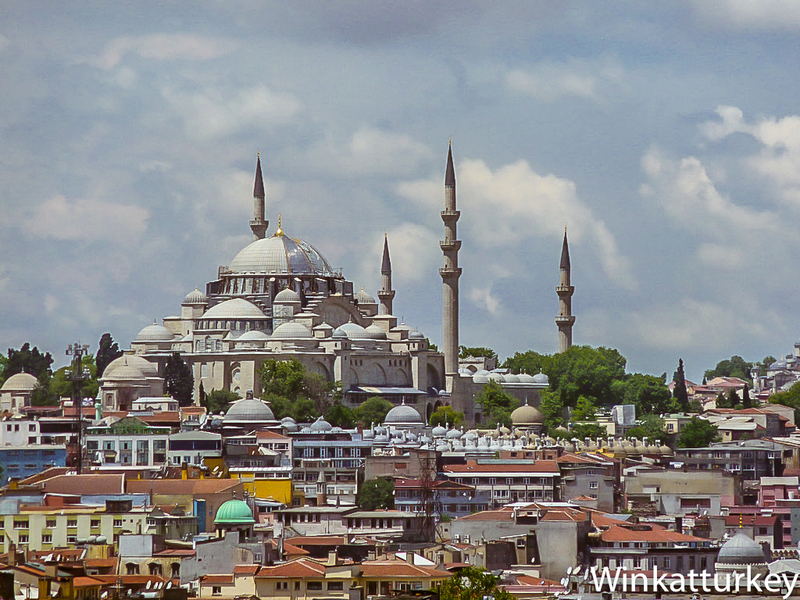 Our visit to Istanbul can not ignore the Suleymaniye, Mosque of Suleiman the Magnificent. The mosque is located near the Grand Bazaar, after the former University of Istanbul. Its location on the Golden Horn, chosen by Suleiman the Magnificent to dominate the city, today keeps something away from the massive influx of tourists visiting the Blue Mosque and Hagia Sophia but fewer visitors is just one of the attractions. The Suleymaniye Mosque is not only one but, like other imperial mosques, is a complex (Kulla) where there are schools, hospital, hamam room for needy, all designed and built by master Sinan between 1550 and 1558. The Suleynamiye has a very similar design to the Hagia Sophia. The huge dome 26 m in diameter and rests on four arches are supported by two half domes. Although the dimensions are somewhat lower than those of the Byzantine basilica, this is a more modern building concept. Symmetry is very neat, the structural supports are hidden and the interior is no subdivision and provides a sense of spaciousness. But 200 decorated glass windows bring light into the interior and carpets are always immaculately preserved. The building has an outer pyramid-shaped structure, it was an absolute novelty. Suleiman did bring columns from various parts of the empire to show the extent of their domains, one of them arrived by boat from Alexandria. For not taking a backseat to the construction, the interior has little Iznik pottery and wood have simple designs in ivory and mother of pearl. The Mihrab and pulpit are marble. Sinan devoted much time to study the Suleymaniye, coming to take personal supervision of the work when the time of delivery of the Great Mosque approaching. The Ottoman architect designed a sound system that perfectly hear the words of the imam in the mosque all, although his voice is low. This placed dozens of pottery vessels distributed throughout the dome so that the sound will amplify. It is said that the master sat smoking his hookah in different parts of the mosque to see how the sound of the bubbles was heard on campus. Another peculiarity is that referring to the formerly used candles for lighting. Sinan devised a system of air currents caused by the movement of water under the ground, that way is getting the smoke from the candles was directed to a room located on the inlet and the decoration of the walls and dome protected. Finally, the soot collected in the room was used to produce a high quality ink which was highly appreciated by calligraphers in Istanbul. The Suleymaniye has a magnificent arcaded courtyard and ablution fountain is intentionally similar to the Kaaba in Mecca. As befitting a Sultan's mosque, has four minarets. Those closest to the building both have three balconies each end and both have two patio balconies. The ten balconies in total symbolize Suleyman was the tenth Ottoman Sultan. When it was finished Suleymaniye, Sinan waited the arrival of the Sultan Mosque door with keys in hand. When Suleiman watched the building, returned the keys to the architect and told him that the honor of opening the door more belonged to who had been to the monument a reality. Today we visit the tomb of Suleiman by the mosque and also find the Roxelana his favorite wife. The Sultan granted Sinan land located northwest of the teacher and lived there the rest of his life. In addition to housing. stables and the school of architecture, there were shops that gave a substantial income Sinan. Finally, he was also buried there and his grave is in front of the north corner of the complex on the street that bears his name. Golden Horn from Suleymaniye. Foto Ytuus, Bob & Jan too. http://flic.kr/p/8hgerY. Ajustes Winkatturkey. Sources for ritual ablutions in the sides of the Suleymaniye. Foto Wikimedia. Gardens of the mosque overlooking the Golden Horn. Foto Wikimedia, ajustes Winkatturkey. Interior of the Suleymaniye. Foto Wikimedia, ajustes Winkatturkey.